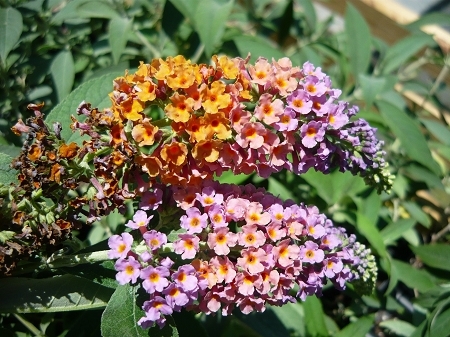 Bi-Color Butterfly Bush (buddleia x weriana 'bi-color)- Beautiful multi-colored blooms. Each pannicle reaching up to 8" features a fragrant rainbow of color from lavenders to yellows. Fast grower. 5' - 6' mature height. Drought tolerant once established. Blooms non-stop late Spring until first frost. Perennial zones 5-9 Live plant in 3 inch container.